Just because you are going hiking does not mean you cannot be pretty. You can go on with your adventure and still look good enough to meet people afterwards. 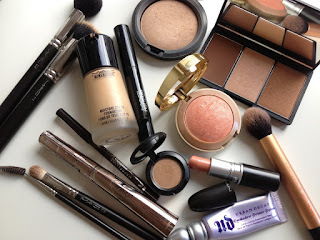 Here are some makeup tips for when you find yourself heading for a hiking trip. Do not apply foundation. There are two reasons for this. The first is that you are bound to get hot and sweaty during hiking. You want your pores to be able to breathe. The second reason is that sweat ruins the foundation and you will then have to reapply. If you are going to reapply a foundation during a hiking trip, you might as well carry your entire makeup kit complete with all the professional makeup brushes. If you have something you want hidden, use a concealer. You can conveniently carry with you a stick concealer for when you need to reapply. Do not use a lipstick. If you are really going for a hiking trip, in addition to running out of breath, you are going to get very thirsty, and very dry mouth. And most of the time, when you are exerting max effort, you will likely bite your lips. What I'm saying is that there will be so much going on with and around your mouth that any attempt at making your lips look pretty using a lipstick will be an utter failure. Use a tinted lip balm instead. It is easier to apply and doesn't turn into a mess.